If you have the schedule showings setting enabled, NowRenting allows Leads to schedule a showing by phone, through an interactive voice response system. Also useful as an accessibility feature, Leads can interact with this system by voice or telephone touchpad. 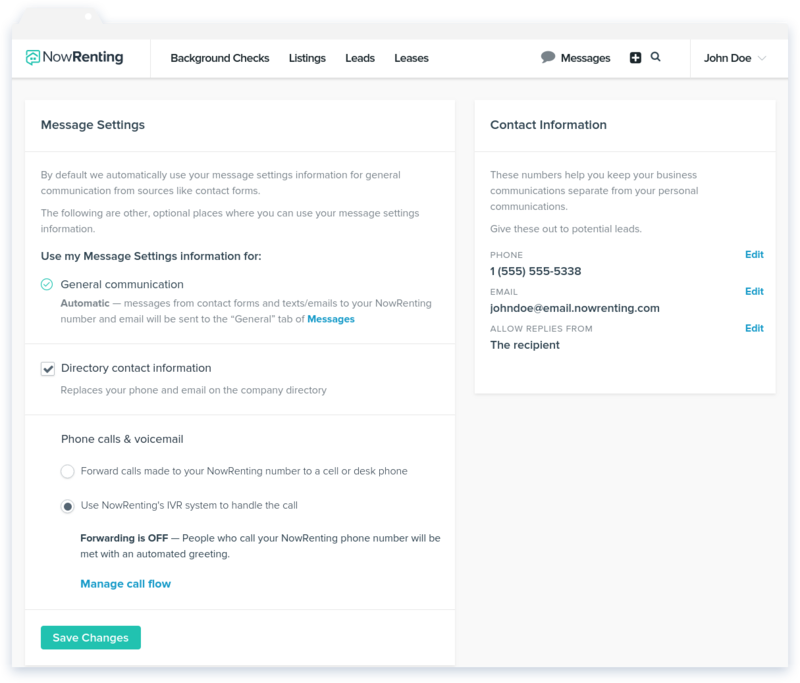 To configure your message settings, go to Settings > Message Settings. This menu allows you to manage your NowRenting contact information. Under the Phone calls & voicemail heading, you can choose to send your NowRenting number’s voice calls to a different phone number, that you specify (such as your office or personal phone) or to use NowRenting’s IVR system to handle those calls. 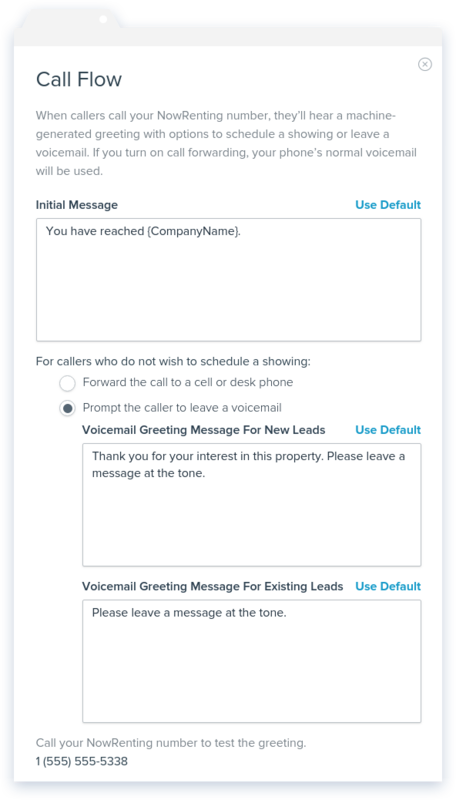 Click the Manage call flow link to set an initial greeting, as well as to specify a voicemail greeting for users who choose not to schedule a showing. Main Menu: The caller can choose to schedule a showing for a particular listing or leave a voicemail. Listing Street Number: If the caller wants to schedule a showing, they’ll be asked for the street number of the listing. Listing Zip Code: If you have multiple Listings with the same street number, they’ll be asked for the zip code of the listing. Listing Address: The system will say the address of the listing. If showings are enabled for the listing, they’ll be asked whether they want to schedule a showing. If the listing is wait listed, they’ll be asked if they’d like to join the wait list. Showing Date: If you have specified availability, the system will offer those dates to the caller first. They will also be able to pick a date for the showing appointment. Showing Time: The caller will be able to specify a time for the showing appointment. Confirmation: The system will say the address, date and time of the showing appointment, and ask for confirmation. Contact Information: The system will ask for an email address or phone number where the caller can be reached. Future communication through NowRenting will be sent there, including confirmation requests, appointment reminders and feedback requests.